This ceramic jar, with its open mouth and rounded shoulder, stands just under a foot in height. Blue and white painted designs—some of plants and animals, some geometric patterns—cover virtually the whole body of the jar. This painting style follows a well-known and well-developed technique of ceramic production in New Spain. Created in, or near the city of Puebla, the ceramic type is known as talavera poblana. The jar’s décor combines local elements, such as the cactus, with design traditions known in China and Europe but imported into Spanish America. Such ceramic vessels make clear both the creativity of artists in Spanish America and the diverse source material from which they chose to draw. The painter of this vessel quickly wielded a soft brush to create bold and schematic forms. This white band that runs along the broad shoulders of the vessel creates two distinct registers, with repeating geometric patterns above and a combination of representational and geometric designs below. In the center of the lower field, a crane perches upon a nopal (prickly pear) cactus. The design refers to both Chinese porcelain designs of cranes atop pine branches and Aztec histories that feature an eagle atop a cactus. 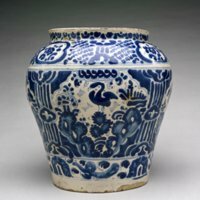 Chinese designs would have become well known in New Spain through Chinese blue-and-white ceramics, especially those of the Ming Dynasty (1368-1644), imported on galleons that annually crossed the Pacific Ocean. Nopal cactuses were native to, and abundant in, New Spain. Neither the patron of this vessel, nor the name of its painter is now known. The decorative patterns featured here parallel other Puebla blue-and-white ceramics from the same period, suggesting that a single workshop may have been responsible for many crane-upon-cactus vessels. From the mid-17th century onwards, local guidelines for ceramic guilds encouraged potters in Puebla to mimic both Spanish- and Chinese-style ceramics. The blue-and-white wares of Puebla thus owe much to local talents as well as foreign models. Jars such as this one would have been produced in considerable quantities. While the design of each vessel would have been distinct (and individually painted), demand for Puebla blue-and-white wares remained high in the 17th and 18th centuries and large quantities of ceramics were made—primarily for use in Spanish America. This vessel is currently housed in New York City, in the Hispanic Society of America. Another, of similar form and design is in the Museum of International Folk Art in Santa Fe, New Mexico. Since 1990, both vessels have been displayed recently in exhibitions in the United States, suggesting how important such objects are to current interpretations of the visual culture and daily life of Spanish America. 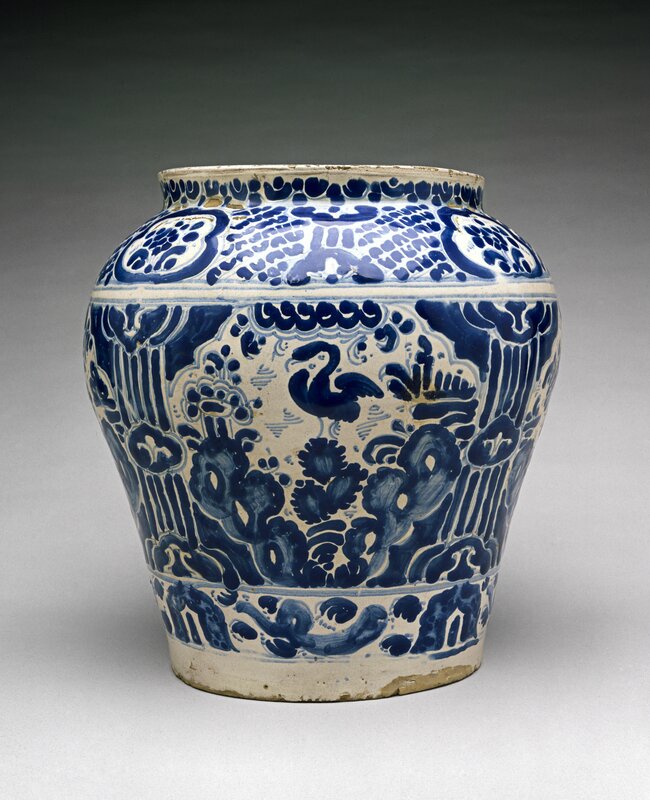 Blue-and-white ceramics from Puebla such as this one indicate to viewers today that Chinese as well as European and local imagery could be combined to form a new and highly desirable aesthetic. Whether the people who owned and used talavera poblana jars, plates and basins consciously saw these objects as “combinations” of disparate origins is less clear. More certain is that the popularity of these ceramics in the 17th and 18th centuries meant that they circulated in many settings and were seen and handled by a large number of people: priests in churches, nuns in convents, and servants in homes.